2016 Lowe Jon L1448T Economical to own and easy to power, Lowe Jons have been serving anglers, hunters and commercial clients since 1972. With durability enhancing features like formed-in keels, strong lifting handles, a deep 20” transom height and a durable paint finish inside-and-out, the Lowe L 1448T Jon is built to last—and built to perform. Please note: This boat model may or may not be in-stock. A Nationally Advertised Price, if listed, may change without notice or include accessories not fully described herein. Please contact your local, authorized dealer for exact details on model availability and package pricing. 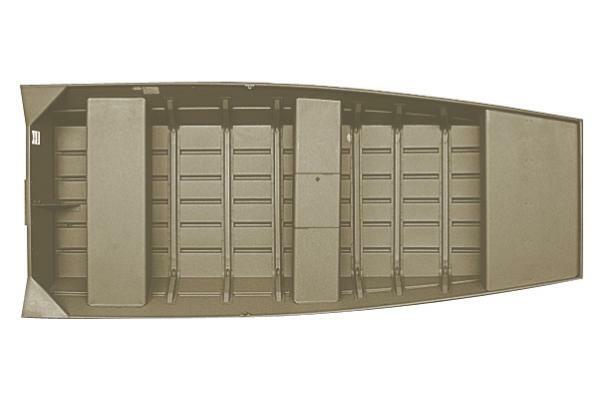 2015 Lowe Jon L1448T This boat model may or may not be in-stock. Please contact your local, authorized dealer for more information. Economical to own and easy to power Lowe Jons have been serving anglers, hunters and commercial clients since 1972. Built with only the best available materials like marine grade 5052-H34 riveted aluminum alloy, these boats are designed to be worked hard and put away wet. With durability enhancing features like rounded, formed-in keels, extruded and coined ribs, strong lifting handles and a durable paint finish inside-and-out your Lowe Jon will be in your family for many great boating years.